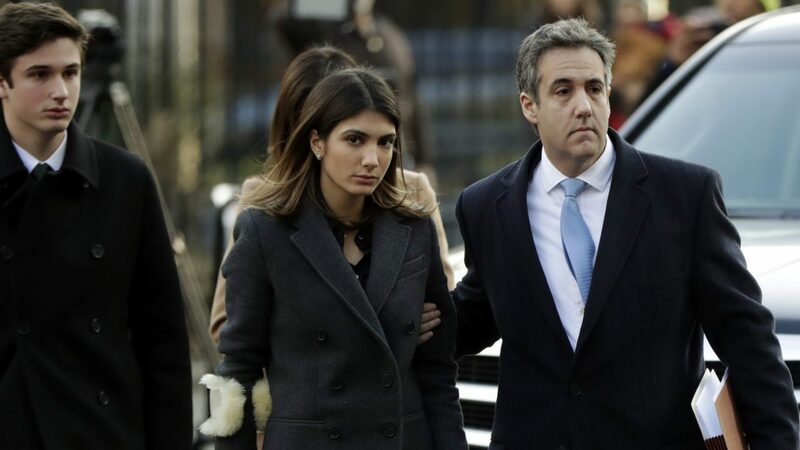 A federal judge sentenced Donald Trump’s former lawyer Michael Cohen to three years in prison on Wednesday following Cohen’s guilty pleas to a number of political and finance crimes. Those three years would be followed by three years of supervised release, and Cohen also is subject to forfeiture of $500,000, restitution of $1.4 million and a $50,000 fine. Cohen had asked for leniency. He said in court, however, that he accepts responsibility for his actions. Cohen said the president had been right to call him “weak,” but not for the reasons that Trump believes. The judge noted that Cohen had a comfortable childhood and loving parents. Cohen’s sentence marked the latest drop in a precipitous fall from the elbow of the powerful man whom Cohen served for years, sometimes as a brutal but fiercely loyal fixer. Now, Trump’s former lawyer has broken completely with his onetime boss and handed the president’s political opponents new weapons that could have serious implications for Trump. First, Cohen told authorities that Trump had directed him to arrange payments to two women ahead of Election Day in 2016 to keep them quiet about sexual relationships they said they had had with Trump — allegations Trump denies. Federal authorities call that a violation of campaign finance law — one for which Trump also may be culpable. Later, Cohen admitted that he and other Trump aides continued negotiations with powerful Russians about a potential real estate project in Moscow well into the 2016 presidential campaign. Cohen had told Congress in 2017 that the talks ended in January, but his subsequent admission meant that Trump’s aides had a channel open with Russia even as Trump was becoming the GOP front-runner and was denying he had any ties to Russia. Cohen “continues to tell the truth about Donald Trump’s misconduct over the years,” Lanny Davis, an adviser to Cohen, said in a statement issued after the sentence was handed down. “Michael has owned up to his mistakes and fully cooperated with [Justice Department] special counsel [Robert] Mueller in his investigation over possible Trump campaign collusion with Russian meddling in the 2016 election,” Davis also said. Trump has dismissed Cohen’s allegations. Although he has acknowledged arranging the hush-money payments to one of the women, he denies the underlying allegations by both women of sexual encounters with him years before the 2016 presidential race. Trump called the payments a “simple private transaction” that had been elevated into something more serious by Democrats who are frustrated they haven’t been able to find anything damaging to Trump in the Russia investigation. The president argued on Twitter that if Cohen broke the law in the payments, it had no meaning for him and might not even be a federal crime anyway. As far as the negotiations over a possible Trump Tower in Moscow, the president acknowledged he had “lightly” looked into the project at the same time as he was campaigning but that he’d done nothing wrong and decided not to pursue the project. Trump says the accounts Cohen has given to investigators are lies he made up in order to reduce the sentence he was facing for other crimes. Cohen also pleaded guilty to tax evasion and bank fraud, which added to the potential sentence for which he was eligible. Attorney Michael Avenatti also said the scheme alleged by Cohen that formed the basis of the campaign-finance violations amounted to seeking to effectively buy an election back in 2016. Authorities said Cohen’s case demonstrates that even powerful people can’t get away with this kind of criminal conduct. “Michael Cohen is a lawyer who, rather than setting an example of respect for the law, instead chose to break the law, repeatedly over many years and in a variety of ways,” said Deputy U.S. Attorney Robert Khuzami, whose office in Manhattan prosecuted Cohen. “His day of reckoning serves as a reminder that we are a nation of laws, with one set of rules that applies equally to everyone,” the federal prosecutor also said of Cohen.